Updated ETA for the Golden Globe Race leader, Jean-Luc Van Den Heede, to reach the finish at Les Sables d’Olonne is the morning of Tuesday 29 January. With less than 126 nm to run, Frenchman Van Den Heede has a 320 nm lead from Dutchman Mark Slats. An updated forecast suggests that the Low pressure system now forming by Brest in France is intensifying fast and moving over Slats in two days, which could be too late to alllow him to catch Van Den Heede. Forecast 29th Jan. 05:00 UTC SW 45k – 08:00 UTC W 50/60k – 12:00 UTC NW 50/65k and 6-7mtr sea. 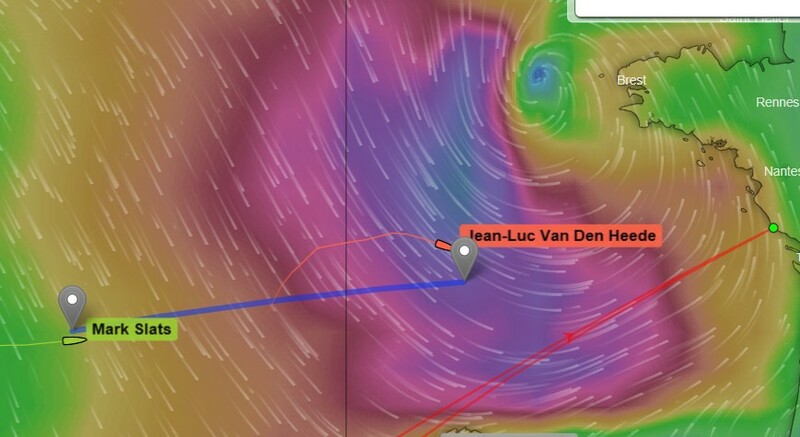 Unless he suffers more gear damage, Van Den Heede should safely reach Les Sables d’Olonne before the worst of the weather hits. The map image above shows Sundays (27 Jan) boat positions, but the weather forecast for the 29 Jan when Slats is 320 miles further on at the end of the Blue line.